Passenger compartment air distribution adjustment. Adjusting the ventilation fan speed. The system controls the ventilation speed, air distribution, air recirculation, and starting and stopping the air conditioning and air temperature. Press button 3 – the integrated indicator light comes on. This function quickly demists and deices the windscreen, the rear screen, the front side windows, and the door mirrors (depending on the vehicle). The air conditioning and rear screen de-icing functions must be activated. It is possible to combine two positions simultaneously – press both buttons 4.
between all the air vents, the front side window demisting air vents and the windscreen demisting vents. to the dashboard air vents. 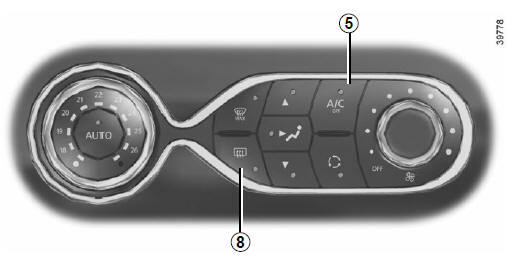 Press button 8 – the integrated indicator light comes on. This function enables rapid demisting or de-icing of the rear screen and de-icing of the door mirrors (on equipped vehicles). 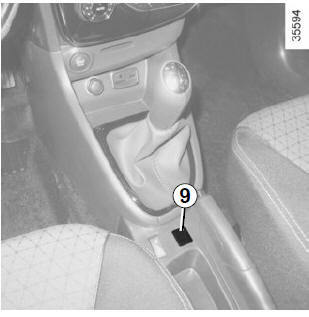 Vehicles fitted with the ECO mode (button 9): Once activated, the ECO mode may reduce the effective performance of the air conditioning. The system determines whether or not the air recycling function is used, based on the quality of the outside air. 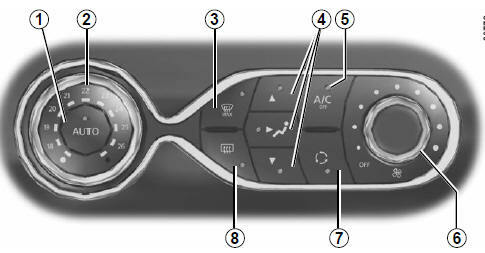 Press button 7 – the integrated indicator light comes on. Turn control 6 to “OFF” to stop the system. To start, turn control 6 again to adjust the blower speed or press button 1.